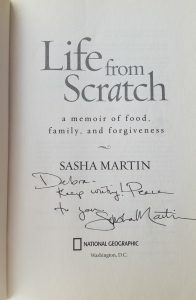 I was anxious to read Life from Scratch by Sasha Martin. Because she has settled in Tulsa, Oklahoma, I consider her a local writer. She had the whole food blogger thing going for her, too. Martin created her blog, Global Table Adventure, to chronicle her Julia/Julie-like quest to cook meals from 195 countries. Along the way she writes Life from Scratch which morphs from an adventure tale of cooking international cuisine to one of examining her family origins and family dynamics. It’s the family dynamics that take up the first part of the book. In fact there are two memoirs working under the same cover, one of her coming to terms with her unorthodox upbringing and her cooking quest while establishing her own place with her own young family. I am a firm believer that every family is dysfunctional in its own unique way. Obviously, some are more whacked-out than others. Martin’s mother though, may take the cake. Martin’s mother is a free spirit and I had a hard time forgiving her for the destiny she put forth for her daughter. There’s a hippy-dippy quality to her mother that I usual admire in people. Hell, in fact I aspire to hippy-dippiness myself. But, there was something in Martin’s tale as she continued to forgive and forget that I just couldn’t wrap my brain around. 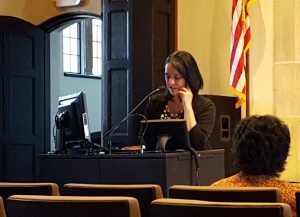 I wrote the above paragraph before I had the pleasure of hearing Martin read from her book and personally meeting with her through the writing symposium. Having not experienced the heartache, longing and tragedy that she lived through in her youth, I still can’t imagine forgiveness….. But, I have such respect for the author, her courage, her work and her motivation. Martin begins her tale by explaining why she doesn’t have fingerprints on two of her fingers. It’s because she grabbed an open broiler at the age of two. This event marks the first time that child services were alerted. That Martin triumphs over abandonment (more than once) and personal tragedy to forgive her mother should be a lengthy tale. Admiringly, she deals with this through her cooking and food. Ultimately, Martin is a much more forgiving person than I.
I don’t think I could forgive some of the decisions that were made for Martin in her youth. Sasha, you are a true saint. By Sasha Martin from Life From Scratch. Argentinian recipe adapted from Francis Mallmann. Original recipe found here. Cut squash in half and remove seeds and strings. Brush cut end liberally with olive oil and sprinkle with salt and pepper. Roast for 45 min-1 hour, or until a fork pierces the flesh with no resistance. Meanwhile, whisk together ingredients for the vinaigrette in a small bowl (vinegar, oil, herbs, salt and pepper). Transfer roasted squash to serving plates. 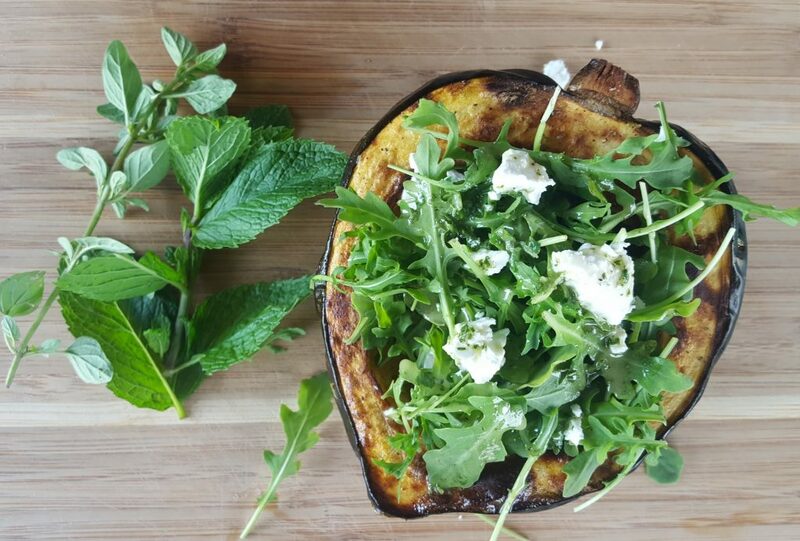 While still steaming, fill the cavities with crumbles of goat cheese and then baby arugula. Add vinaigrette to taste and toss, being sure to scrape the squash flesh into salad as you toss. Eat immediately. For just the two of us, I only did one squash and halved all the ingredients. I chose this recipe because of its resemblance to a salad (you, know…our healthy eating…) I will keep this recipe in our rotation because it is delicious. It would also be good with butternut squash or small pumpkins. I think I will use basil and oregano the next time I make this and leave out the mint. Or, maybe I will use all three. All of the recipes in the book are straight forward and written in Martin’s voice. There’s a “glug of olive oil” here and a “pinch” of this and that. Although the book features her international recipes, most are doable for the home cook. 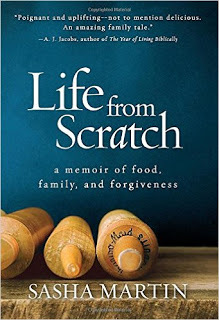 Life from Scratch is the current selection for Cook the Books which I am hosting. Our membership is open to anyone and although time is almost up for this round, please consider joining for the June/July selection, Mastering the Art of Soviet Cooking: A Memoir of Food and Longing by Anya Von Bremzen. Simona at briciole will be hosting. Look for an announcement post soon at Cook the Books. I am also linking up with Deb’s (a CTB co-host) Souper Sunday. Finally, I am linking with May’s Foodies Read. How could you have acorn squash at this time of year!!??? This is not fair!! Wish I could reach in and dig in, Deb. I was so set on making this recipe and I was worried I couldn’t find one. Sprouts came through for me. yeah i had a though time with her mom too, she does take the cake … had it been winter I would have made the German cake lol. it was a very unexpected read, hard at times. 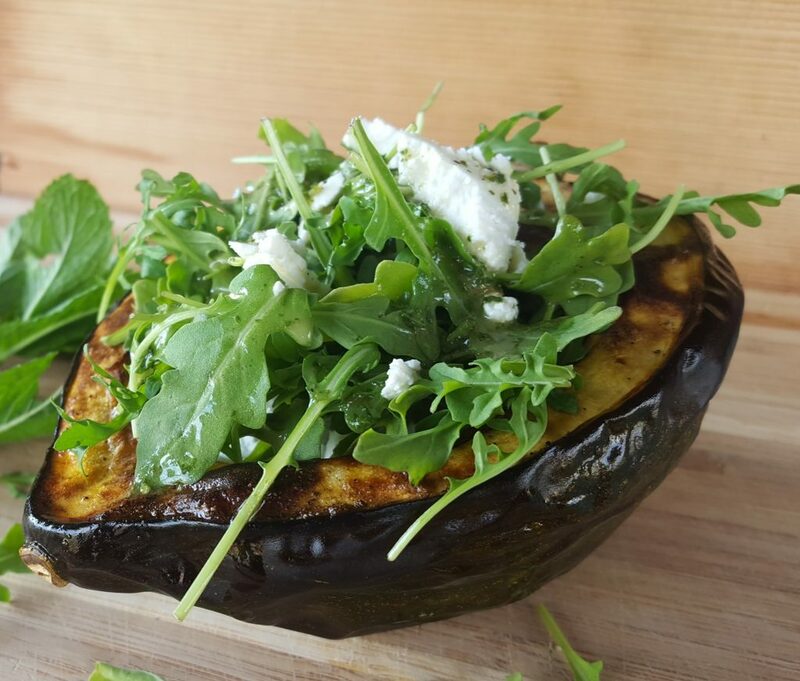 I do love this acorn squash salad for sure, a mix of fall and spring! Yep…We can’t pick family. We just have to love them, ignore behavior (sometimes) and forgive a lot. Martin is really a true saint in my opinion. Every family is definitely dysfunctional in its own way. Haven’t read this (my reading has been stuck in the 19th century for ages) but sounds interesting. Really inspired recipe! Thanks so much. I never could get my hands on this book – our library didn’t have it and then I was laid up with illness. Now that’s awful to leave you an excuse ridden comment like this, but i wanted you to know I really truly did want to participate!!! Love your choice of representative dish. Gosh that squash looks good. Well, bummer, Tina. I think you would have liked it. 🙂 Squash is delicious! Sounds like her life triumphed over many obstacles…that is good. The salad sounds different and I’m sure it is delicious. Martin did have a lot of obstacles but definitely persevered through it all. You definitely made me want to avoid this book. I find that type of Mommy-Dearest memoir a bit tedious, and I prefer ethnic, regional, and other foods that are new to me to be introduced by the people of that group, not by a culinary tourist. So thanks for the heads-up, and for your very good review. However, I’m a very big fan of Mastering The Art of Soviet Cooking, so I’ll look forward to your review and recipe next month, if not actually participate. It’s really full of history and wonderful food stories. I hope I didn’t give the impression that she tediously berated her mother throughout. If anything, my issue was with the depiction of her mother with little or no judgment (which I had a hard time connecting with). Not sure that makes a lot of sense, but Martin is much more forgiving than I. Thanks for choosing this book, Debra. I think that anyone who reads this story is going to be disgusted with the mother and amazed at Sasha’s capacity to forgive. I think that this dish sounds wonderful too. Good review, as you say, forgiveness is essential, for all of us, and for our own peace of mind. 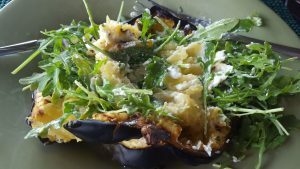 The salad is something I’d like to try, that combination of hot squash, which doesn’t usually find its way into salad, with goat chevre and arugula. This salad, while a little odd sounding, is delicious, Claudia. I definitely felt the same way about her mother but found myself almost more angry at times with the Dumont’s and amazed at Sasha’s capacity for forgiveness for everyone–though I think she took blame for things she shouldn’t. Anyway, although I liked the second half more, i enjoyed the book and I am glad you picked it. Thanks for hosting. The salad looks amazing–so pretty on the plate. I think this is how I want to eat acorn squash from now on. 😉 Thanks for sharing it with Souper Sundays this week. I would highly recommend this as a salad vessel! I have noticed a few others that thought Martin took the blame for far too much. She certainly has a great capacity for forgiveness. Thanks for reading, Deb! I think every family has its own things and as long as they are solvable it is ok! The salad is delicious chevre is a cheese that goes perfectly with greens! Oh wow – that looks divine!! This is a nice recipe. I am also impressed you found acorn squash this time of the year. I love mint, but it tends to be overpowering (as a plant too). I think it is so nice that you met Martin and got her to sign the book.